A Day Dreamer's World: Shipwrecked Read-a-long and Giveaway! On Monday 19th August, my Goodreads page 'Fandom Freak-Out'(which you can join by clicking here) is holding a read-a-long until Thursday 29th August . A Fandom Freak-Out was a group a set up where you can openly discuss the latest book fandoms including: 'The Hunger Games', 'Divergent', 'The Fault in Our Stars', 'The Mortal Instruments' and soon to be updated with 'Vampire Academy' news. "I jump at the sound of a whispered voice over my shoulder. But when I turn round all I see is sand, and the towering, green wall of the rainforest. I guess it must have been the breeze, but I can't help shivering. I have the weirdest feeling that we're being watched." Grace Delaney and her fellow dance students are en route to perform on a South Pacific cruise-ship when a freak storm hits and they find themselves stranded on a deserted island. With the tropical heat rising, passions and tensions swell to breaking point. And the island itself is quietly steaming with a terrible secret. What I'm looking forward to: Siobhan Curham's writing! It's always so refreshing and packed full of humour. Although, this is really different compared to her previous books, ' Dear Dylan and 'Finding Cherokee Brown' so, in that sense, I'm excited to see where Siobhan takes this story and the imaginative side of things. Also, we have a gorgeous banner designed by Ruby, which I love! It completely reflects the book's atmosphere! I received a signed copy of this book for review over two months ago now, so I can't wait to finally get around to it. I've also been given the chance to hold a give-a-way on this blog to win a signed copy of the book. UPDATE: This giveaway is now international, thank-you Siobhan! You can enter the giveaway below! Are you joining in with the read-a-long? 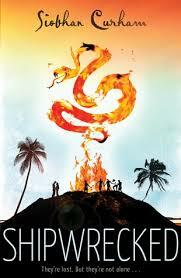 If so, what are you most looking forward to about reading Shipwrecked? If you haven't signed-up already, you can do by clicking this link! I'm really excited to start reading this book! Even though Dear Dylan didn't blow me away, it was still a fun read. I don't think I've ever read a book about being shipwrecked before so it should be interesting. Read-a-longs are so much fun :D I won't enter the giveaway since I already have a signed copy (as you know) but good luck to everyone who enters. Thanks for sharing, Sophie!